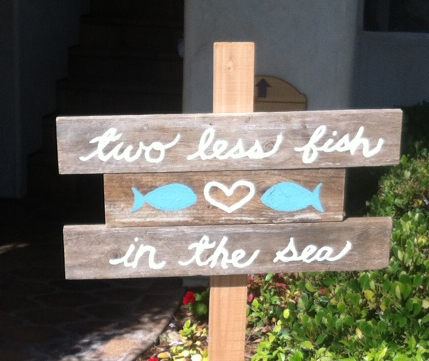 Small touches make a big difference when planning a beach theme wedding. We attended a wedding last weekend and the attention to small detail really gave the whole courtyard a beautiful beach ambience. The entrance had a surfboard (custom shaped by the groom), set on a wood stand, for all the guests to sign. For the guest card they had an “old wood treasure chest.” They had another small wood box with shells for recipes. They had requested guests to share one of their favorite recipes with the bride and groom. There were small beach wood type signs all around with quotes and poems. The bride and groom table was a small table decorated with beach shells and rope and rather than two standard chairs they had a shabby chic white loveseat. That little change really worked well. The arch above the bride and groom was all natural with protea flowers and drift wood.